Agarast gradually transmogrifies your creatures into small bands of goblins too battlecrazed not to attack. Note that if you run out of real creatures, he'll start killing your goblins with no upside at all. This guy's all about killing and fighting. Or watching killing and fighting, anyhow. Collusion is an ability word aimed at multiplayer because it's either meaningless or a corner-case downside in a duel. In the multiplayer realm (other than 2HG), it's fairly interesting. It's powered entirely by politics, but simple politics will do. "You're attacking my enemy? Colluded." 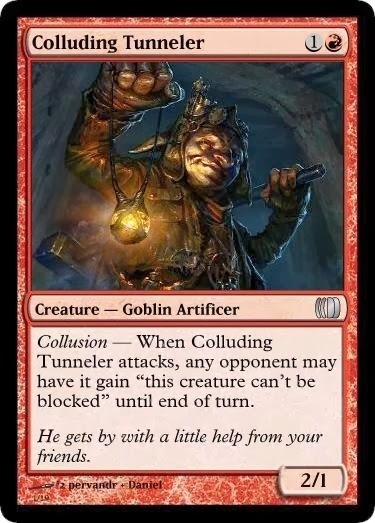 Colluding Tunneler is a perfect use of the mechanic. Flarko wants to be the only thing blocking (though defender's thwart that) and he exploits your opponent's inability to block with a whole lot of card selection. 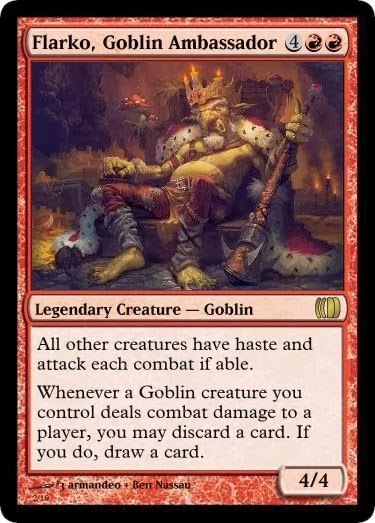 At 6 mana, this might not make it out of Standard, but it's a very different Goblin lord and has some serious appeal for Commander. Goblin Accountant reads simply enough, but the ability will often prove far more work to execute than the impact it has on the game. The exception perhaps being when you sideboard it in a duel against a player running graft/evolve/heroic/etc. Goblin Artisan (as opposed to Goblin Artisans) can Shatter or Divination every turn, provided your opponent has enough artifacts. I enjoy the punisher mechanic and it's interesting that this can't be activated when your opponent has no artifacts. 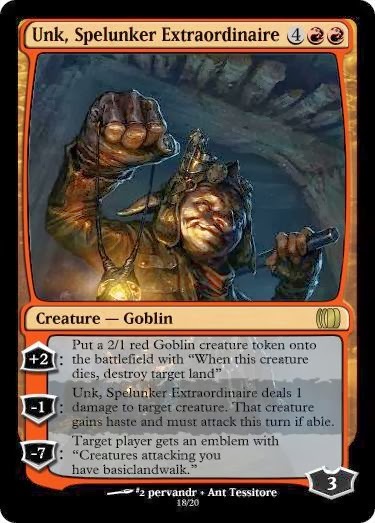 I guess it's good this guy is always at least a Goblin Piker. 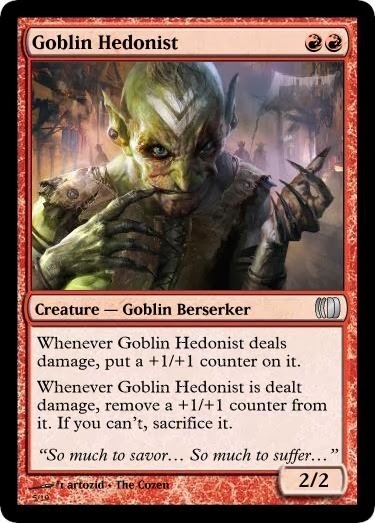 Goblin Hedonist loves dealing damage but hates taking it. That's neat, but this execution suffers from a significant drawback that it requires strong knowledge of the stack to keep from accidentally killing your own guy. It doesn't help that all that text will cancel itself out more often than not. Goblin Mine is a Spreading Seas that gives you a goblin instead of a card. I'm sure that red can have an effect like this since it's the primary color for land destruction, but I suspect that Blood Moon et al might want to turn the land into a basic Mountain instead. Maybe being more different from Spreading Seas is best. Ipaulsen's Goblin Survivalist is unusually hearty for a red creature, something we normally only see in Phoenixes and Squee, Goblin Nabob. Red was one of the three undying colors in Innistrad, so it's not unheard of. I would be shocked, however, to see this mechanic on a single red non-Phoenix, non-Legend. Could this be a keyword? Something halfway between Phantom Tiger and Scuzzback Marauders? This Fire Juggler has gotten an upgrade both in price and in forcing a block (though it's also smaller when the opponent has no creatures). Boggart Bombardier is sort of a red Cruel Edict …on a stick. Not necessarily strong, but plenty fun. Goblin Swindler is a dirt simple uncommon upgrade of Goblin Piker with a nice chunk of variance in its ability. I want this to be a real card right now. Goblin Tomb Raider has two neat little abilities that make no sense together. I'd like to see this split into a pair of distinct cards. Goblin Vanguard probably isn't playable even if your opponent is running a playset of Mercy Killing. I'd like to see less niche ability like "If a spell or ability an opponent controls could target CARDNAME, it must" and perhaps on a card that won't make you hate yourself when that ability isn't relevant. Goblin Visionary is inobviously a punisher version of Stone Rain: "Either let me kill this land, or I get a cheap Goblin King." That's fairly clever, though I wonder if we can make it more clear. My big concern is how well players will track which land you targeted five turns later. Goldbelly claims all the trash you've buried as gold and then uses his wealth to fix it up and reuse it. If you overthink it, that double metaphor is a little odd, but if you don't, this is a fun card with a great story. 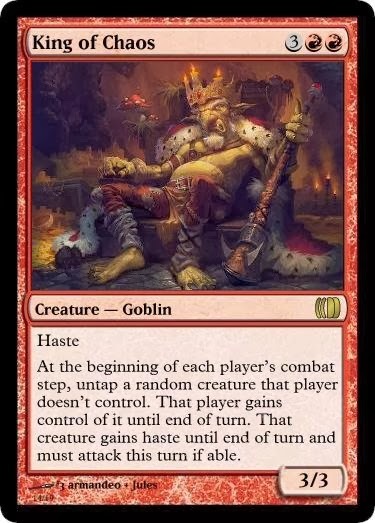 Hated Overlord is another two-mana goblin lord, this time telling a fun story about what kind of ruler he is. It's high-risk, high-reward: something most goblin players can really get into, even if it proves too vulnerable for tournament play. King of Chaos gives each player a free—but random—Act of Treason every turn. Well named, and very red. Casual red players will mostly love this. 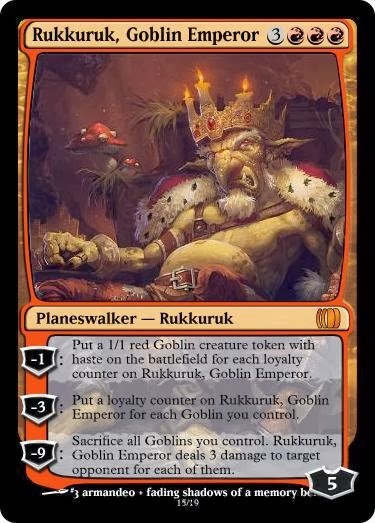 Rukkuruk is the goblin lord of planeswalkers. If you cast him with 7 goblins out, he can jump to 9 loyalty immediately and if he and most of your goblins aren't removed before your next turn, could win it straight out. That's not exactly an easy feat, and not many goblin decks even want to get to six mana, so this is aimed squarely at Johnnies and Timmy-Johnnies, offering a distinctly different way to win with goblins. Oh, and I guess a Goblin Rally every turn wouldn't be bad in Limited. Slums Swill-Dealer uses more text than he needs to make an interesting card. 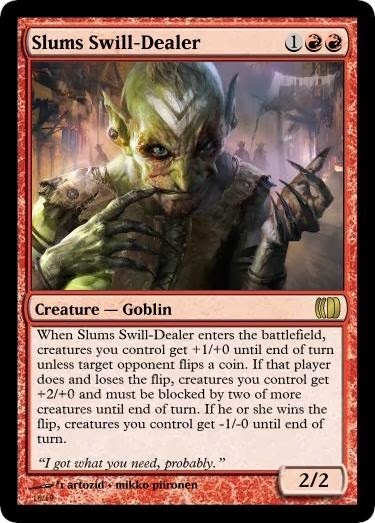 I'd suggest "When Slums Swill-Dealer enters the battlefield, creatures you control get +1/+0 until end of turn unless target opponent flips a coin. 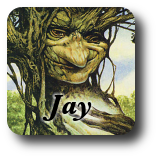 If that player does and loses the flip, creatures you control get +2/+0 until end of turn." Unk will make a Goblin Gardener every turn, and can Crack the Whip, and his ultimate makes a player unable to defend herself unless she's running only money-lands or can sacrifice her basics. I'd prefer something along the lines of Stone Spirit since I don't want to promote either of those things. I have no idea if this is too good or too bad. It probably varies considerably depending on the game. Tons of wacky, fun and funny goblins here. Nice work. GOLDBELLY CLAIMS NOT TRASH. GOLDBELLY CLAIMS ONLY GOLD. THEN USES GOLD TO MAKE MORE GOLD. GOLDBELLY DOES NOT UNDERSTAND ECONOMICS. Yeah, any sort of "this guy dies first" mechanic would be fitting for my idea, so I guess I went with the one that read best instead of played best (given that I didn't playtest it).